I’ve used several different tournament management software packages over the years that I’ve run the Portland (Oregon) tournament. For the past couple of years, I’ve been using GoClubsOnline (GCOL). This has certainly been the most stable, least frustrating option and I plan to continue using it and recommend it to others. GCOL works through a web browser and all data is stored remotely in the “cloud”, so there’s no worry of files being corrupted or lost. That does mean, however, that GCOL is not the right choice for a tournament director (TD) without reliable internet access. For the TD, a package like this has two core jobs: pairing (deciding who plays whom) and recording results. Pairing is notoriously difficult because there are many constraints. GCOL does as good a job at this as any software I’ve used, with a plethora of options, like avoiding pairing players who live in the same city. While GCOL has on rare occasions given me some strange pairings it allows the TD to make some pairings manually and then automatically re-generate the rest. This is a recurring strength of GCOL: if something doesn’t work perfectly, there’s almost always a workaround. There are a number of options for communicating the pairings to players. With two or three dozen players, I tend to just turn my laptop screen where they can see it, but you can print out pairings as well. 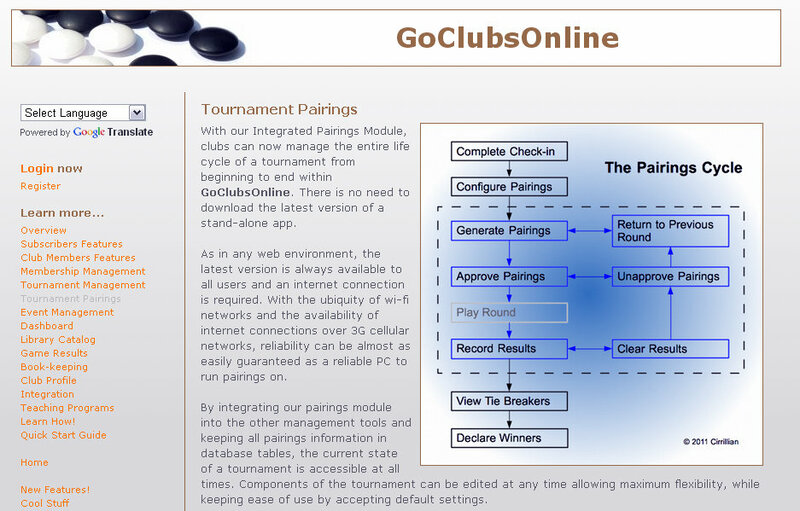 Players can also log into the GoClubsOnline site and see their pairings and results. Recording results is as easy as checking boxes. These can be displayed in the same variety of ways, and winners can be automatically computed; in my tournament, I compute the top three in each of dan, single-digit kyu, and double-digit kyu. The otherwise-tedious process of emailing the results to the AGA is accomplished with a few mouse clicks. The stability of these basic features alone makes GCOL worth using, but there is much more. Players can register in advance online, for example, drastically reducing check-in time. GCOL also keeps track of income and expenses and how much needs to be forwarded to the AGA for tournament fees. Is it perfect? Not quite yet. The system does take a bit of learning, as there are many options, but the default settings are generally good. Some may balk at the annual $39 cost, but this only covers “out-of-pocket expense” according to GCOL’s author, Robert Cordingley 2k of Sante Fe. “It is still very much a volunteer effort,” he explains. We are fortunate to have a volunteer willing and able to produce such complex, high-quality software for such an obscure niche. Cordingley has been extremely helpful; I’ve often been able to get help from him during a tournament and he’s added features requested by various TDs, like allowing players to specify meal preferences at a tournament serving lunch. GoClubsOnline is reliable, clean, and easy to use. I have every reason to expect that it will become even more so as the number of users increases. Drake is the Tournament Director of the Portland (Oregon) Go Tournament and runs the Lewis & Clark College Go Club in Portland.